Here are some pinfire cartridges with explosive bullets. The two on the right are definitively made using Eugene Pertuiset’s patented formula by SFM. The rest are also thought to be. 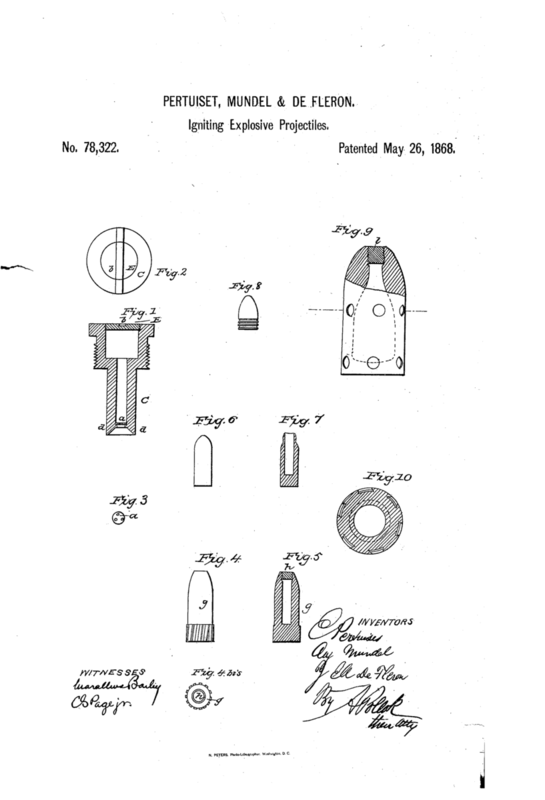 In the late 1860s a Frenchman names Eugene Pertuiset developed an special fulminate that would be inserted into a tube inside these bullets. When the bullet hit its target the heat produced from the kinetic energy coming to a stop would ignite the explosive powder. The Times of London, at the time reported on a demonstration at a horse slaughterhouse of these being tested and demonstrated on a beast that had “been condemned as irreclaimably vicious”. Long story short; when the horse was shot it pretty much blew out nearly all of its head and liquified its brain. The witnesses were pretty impressed that this kind of damage could be done by something a man could carry in his pocket. Russia actually adopted its use for a short time until the Saint Petersburg Declaration of 1868 — which succeeded the First Geneva Convention — renounced the use, in time of war, of small explosive projectiles in Russia and Europe. The United States declined to hamper themselves by any such agreement. 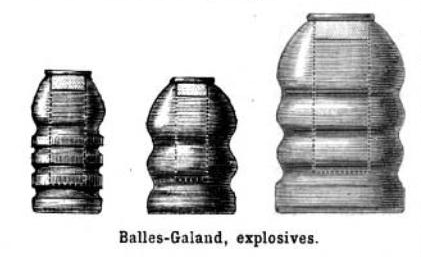 According to the publication, Album-Galand, Galand’s shop sold Purtuiset bullets in boxes of 25 for 32 francs for 4g and 8g, 22 francs for 10g and 22 francs for smaller sizes. 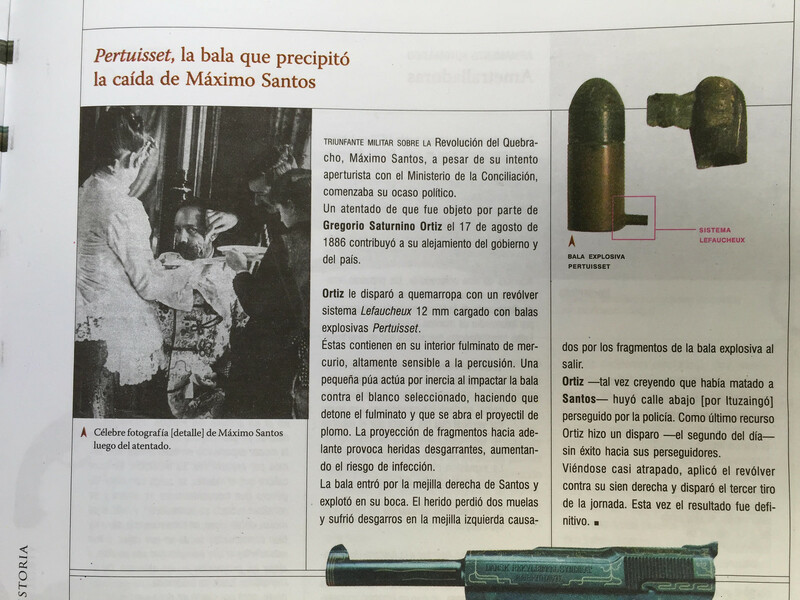 This publication also states that Galand made his own explosive bullets as well. A famous photograph [detail] Maximum Santos after the attack. Triumphant Revolution MILITARY ON Quebracho, Maximo Santos, despite its openness attempt with the Ministry of Reconciliation, began his political demise. An attack that was subjected by Gregorio Saturnino Ortiz August 17, 1886 contributed to his departure from government and the country. Ortiz shot him at point blank range with a revolver Lefaucheux system 12 mm Pertuisset loaded with explosive bullets. They contain in their inner mercury fulminate, highly sensitive to percussion. A small spike acts by inertia when the bullet hit against the selected target, causing detonation fulminate and lead the projectile is opened. Projection of fragments forward causes tearing wounds, increasing the risk of infection. The bullet entered his right cheek Santos and exploded in your mouth. The he wounded lost two teeth and suffered lacerations on his left cheek caused by fragments of explosive bullet out. Ortiz – perhaps thinking he had killed Santos – fled down the street [for Ituzaingó] chased by police. As a last resort Ortiz fired a shot – the second day – without success to his pursuers. He caught looking almost applied the revolver to his right temple and fired the third shot of the day. This time the result was final. 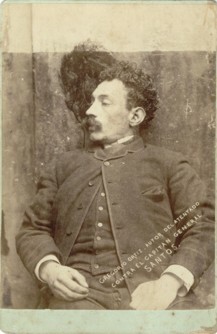 And a picture of Gregorio Saturnino Ortiz after he committed suicide with the explosive Pertuiset pinfire cartridge.